To fly on the space shuttle while his wife is recovering from a bullet wound to the head, astronaut Mark Kelly will have to call on his years of experience compartmentalizing his feelings and focusing on the job at hand. Kelly's wife, Congresswoman Gabrielle Giffords (D-Ariz.) was shot Jan. 8 at a constituent meeting in Tucson, Ariz. Six people were killed and 19 wounded, including Giffords. Today (Feb. 4) Kelly announced that he will go through with his planned mission of flying aboard the space shuttle Endeavour's final mission in April. While some might not be able to contemplate participating in such a complex mission at such a time, Kelly said he considered what was best for NASA and Endeavour's STS-134 mission, as well as for himself and his family. 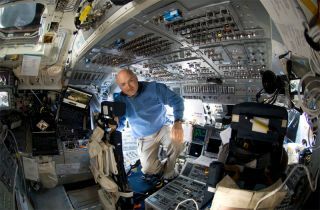 He said he put aside personal considerations, such as the fact that this is his last chance to fly on another space shuttle mission, as well as any anger he felt about his wife's situation or a desire to resume a normal life. "What I used to evaluate whether I first want to come back has little to do, or nothing to do, with being angry and everything to do with what is right for NASA first and then for me and my family," Kelly said during today's press conference. In describing how he would be able to focus on the mission, Kelly emphasized his experience compartmentalizing his feelings. "You learn to separate the mission from things that might be going on in your personal life," Kelly said. "I've been doing that for 24 years." Kelly, 46, is a veteran astronaut and captain in the U.S. Navy.He is a former test pilot and flew 39 combat missions during Operation Desert Storm. Kelly said he learned very on in the military to focus on the job at hand, though he acknowledged that now it might be more difficult than ever before. "This time it might be more challenging at times to do that," he said. One way he was able to prove that he was up to the task was by rejoining his crew last week for training on a trial basis. He underwent hours-long mission simulations that required intense focus, and even spent a night away from Houston, where Giffords is undergoing rehab. "This week I demonstrated, to myself even, that I was able to do that," Kelly said. "It told me that in this situation I am able to do that compartmentalization which I have been practicing for 24 years." Kelly said that he is not the only one who must set aside personal feelings for Giffords in order to fulfill a space mission. His identical twin brother Scott Kelly is also a Navy captain, former test pilot and a NASA astronaut. Scott Kelly is currently commanding the International Space Station. "He's in a difficult situation. When something like this happens, it's a traumatic event," Mark Kelly said of his brother. "He wants to be helpful" but he struggles with being so far away. Scott Kelly will return to Earth aboard a Russian Soyuz capsule in mid-March, exactly one month before Mark will blast off on Discovery. Mark said he expects Scott will want to help as much as possible after returning to home to Houston. Meanwhile, NASA said Mark Kelly's first week back at work was also a chance for the space agency to evaluate Mark Kelly and confirm that he would be able to devote his full attention to the mission, both during training and in space. "It was important to know he would be able to focus during training and not be distracted by Gabrielle's situation up at the hospital," said Brent Jett, chief of NASA's flight crew operations directorate. NASA officials said they initially left the decision about whether to take part in the mission up to Kelly, but then took steps to make sure they could trust that he would be able to carry out the job to the best of his ability. "We weren't going to ask him to command 134 unless he felt comfortable and ready to do that," said Peggy Whitson, chief of the astronaut office at NASA's Johnson Space Center in Houston.